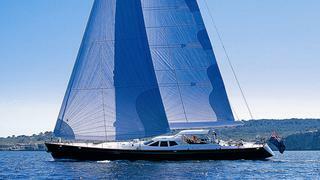 Now for the 259th sale this year as Mark Duncan at Yachting Partners International tells me that Will Bishop acted for the buyer in the sale of the 29.13m Pendennis-built sailing yacht Margaret Ann, a central listing at Burgess. Designed by Dubois and built in 2004, with interior design by Redman Whiteley Dixon, Margaret Ann has had one owner since her launch and has been consistently maintained to a very high standard. Below her teak-laid decks she accommodates six guests in three cabins and a crew of four in two cabins. She is classed to Lloyd’s and is MCA compliant. In 2008/9 she had an extensive refit that included a full repaint, a Lloyd’s 5-year survey and rig pull. Margaret Ann was asking €4.95 million.